The Cemberlitas Hamam is one of many historical bath houses in our mystery country, as well as thoroughly modern ones, usually in luxury hotels. Cemberlitas dates from 1584 and was designed by the great Ottoman architect, Sinan. Towel-clad bathers are separated by gender and can do their own douse-lather-scrub-douse treatment or pay a bit extra to have an attendant do it for them. Traditionally, the hamam has been as much a place to socialize as to get clean; and lounging about on the central platform is part of the experience. Can you name that country? What about the city? 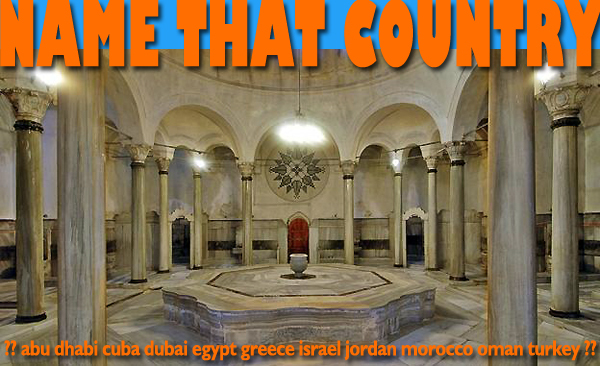 This entry was posted in name that country quiz, Turkey and tagged cemberlitas hamam, tours to turkey, Turkey by yalla2013. Bookmark the permalink.